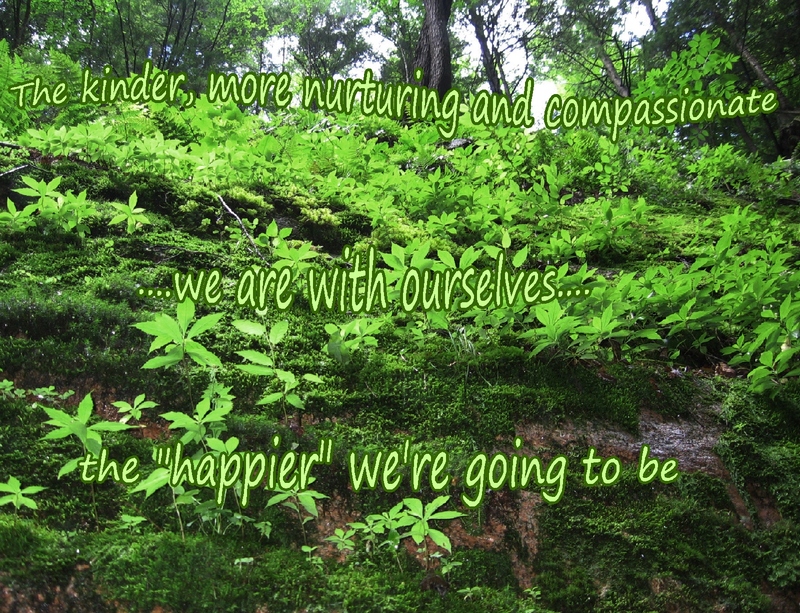 Perhaps some of us who tend to be “helpers” or “nurturers” may not be offering as much kindness or compassion to ourselves? 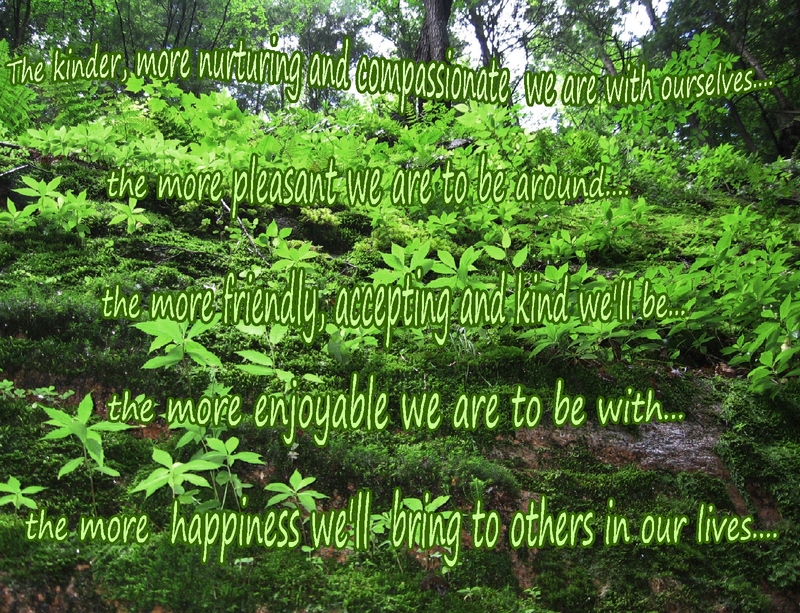 Maybe we’ve “misunderstood” or misperceived, and think it’s bit “selfish” or “self absorbed” to be more nurturing or compassionate with ourselves? Or perhaps we’ve held ourselves up to overly high “standards” or “demands” for ourselves?…. at times, comparing ourselves unfavorably with others? seeing where there might be perceived areas of need in ourselves, rather than focusing on areas of strengths? It’s so easy to slip into those less kind points of view…and so potentially harmful for both ourselves and others. Maybe we thought those overly high expectations led to happiness? I suppose I might have thought that they would. But…they didn’t…and they don’t! Through the past few years I’ve learned differently! I’ve observed that the kinder, more nurturing and compassionate I am with myself, the happier I’ve become. And the happier I’ve become, the more I’ve passed that happiness along to others in my life. 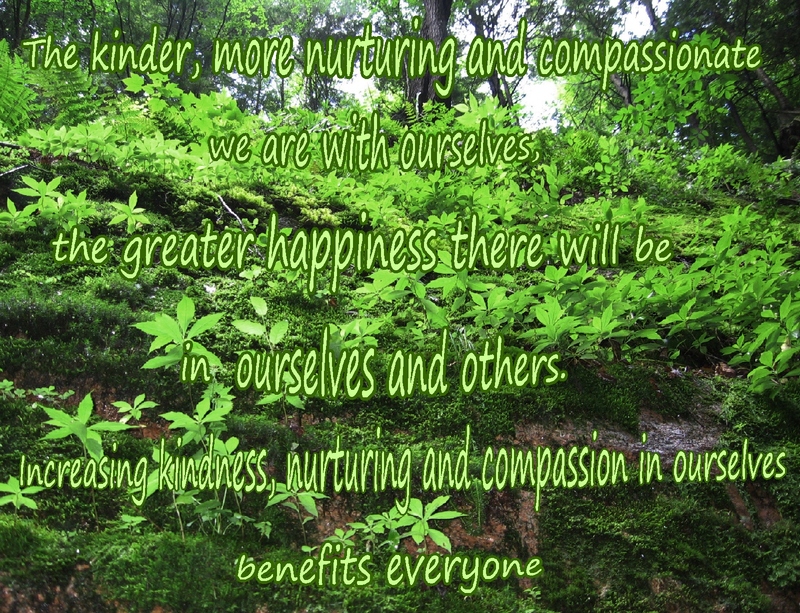 Strangely enough, this increasing of self kindness, self compassion and nurturing my own happiness (which did not come “naturally”), has led to more happiness in others, too! What a wonderful surprise that’s been! This entry was posted in Happiness and tagged Awareness, Compassion, Encouragement, Generosity, Happiness, Inspiration, Kindness, Life, Loving kindness, Mindfulness, Motivation, Spirituality, Wisdom. Bookmark the permalink. Thank you Roberta… I had a bit of a challenge finding words to try to explain what I was trying to “say”… the ideas in the post are somewhat of a new awareness for me…still going in. I hope it has some helpful ideas for others,too. Robin, I haven’t been getting email notifications of your posts…I’d better find out what happened to mysettings… wonder where they went???? Happy to hear you’re posting! 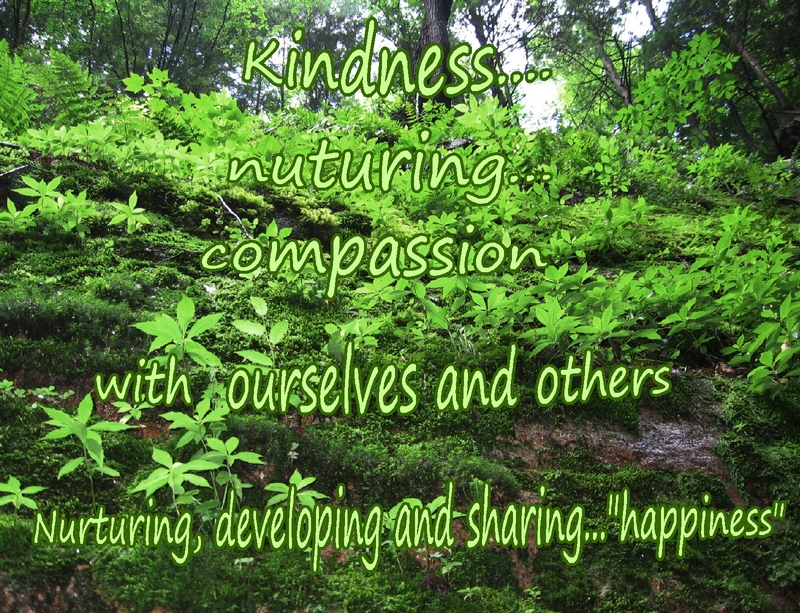 Pingback: Nurturing Thursday – KindSight | "On Dragonfly Wings with Buttercup Tea"
a wonderful reminder of how important and how impactful kindness towards our own precious self is. We are so quick to be harsh and unforgiving of our self and to expect things we don’t ever expect of others. I sometimes ask myself “if you were speaking about this to a friend, what would you say?’ it’s my way of reminding my self to be as kind to me as I am to others. Joss….good ideas…thank you. Isn’t it strange how kind so many of us are to and with others, but far less so with ourselves???? …well, I think it’s the perfect time for all of us to change…… now offering more nurturing and kindness to ourselves, too. I tend to be hard on myself at times, but i am working on releasing this totally from my mind. I posted a quote today in my Facebook page about focusing only on the good in our lives, not on what we don’t like from our childhood, adolescence and adulthood. This is actually being kind to ourselves. Your message on how being kind and compassionate to ourselves actually helps us to bring happiness to others makes perfect sense! Marie, those are such good ideas that you’re posting. I think that for “helpful” kinds of people that it might help to realize that nurturing oneself will benefit others, too…at least it did for me. I like that, Nancy…. “compassion starts at home,”…. 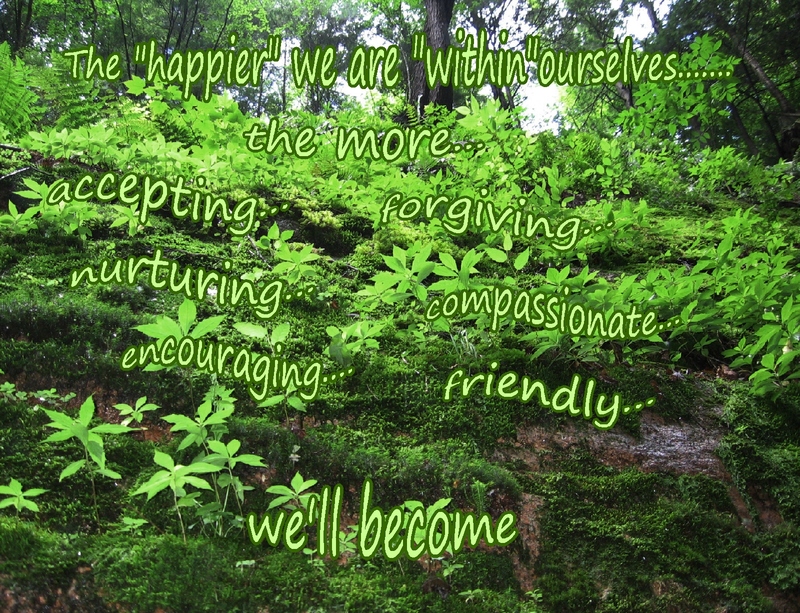 “home” being within oneself…good way to phrase that…. BFF and I just enjoyed a peek at the Planetary Triple of Venus (bottom), Jupiter (left) and Mercury (right) in the night sky just past sunset. We’re going to head out again in a few minutes when the sky is a tad darker . . . but I think there are now too many clouds. I had it written on the calendar for last night…and we were going to drive up to the top of the Berkeley hills to watch “them,” but it was really foggy over the whole bay last evening, so no go. And I just checked the live cam over the bay…foggy again tonight too! What a disappointment. Maybe the weather will clear tomorrow eve. We were “sidetracked” last night . . . and almost missed the window of opportunity tonight. Now the clouds have rolled in and blotted out the planets. I’ll keep my fingers crossed that you have fog-free viewing tomorrow.